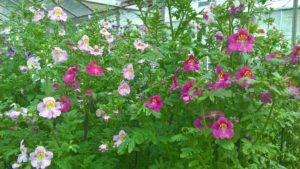 Schizanthus are commonly known as ‘poor man’s orchids’, as the multi-coloured flowers resemble miniature orchids, but can be grown from seed at a fraction of the price. They grow to between 30 and 50 cm tall and flower colours include red, pink, purple or white often with central, contrasting markings. Schizanthus are annuals or biennials and were very popular during the Victorian Era, but became unfashionable in the 20th century. We sow our seed in October to ensure flowering plants in April.